(Updated, 1:46 p.m. EST) -- In its latest update, Carnival Cruise Line reported some basic services and hotel functionality have been restored to Carnival Triumph, which remains adrift in the Gulf of Mexico. The freshwater system, part of the sewage system, limited elevator service and some power in the Lido dining area are operational. But some family members of passengers on the ship are reporting the situation is still very uncomfortable. LynnA (February 12, 1:09 p.m.) – [Feces] and [urine] rolling across floor with every wave. People sick and throwing up every where. 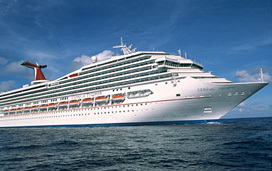 NTFF (February 12, 1:47 a.m.) – My wife is aboard for her very first cruise. She and her best friend have a cabin just forward of the centerline of the ship. She has reported to me through texts, and 2 phone calls she managed to get out while the other ships were moving supplies aboard. She tells me she has not heard of or seen any functioning restrooms/etc. She said she not not seen anyone fighting for food, but she had seen that people waiting in very long lines were pileing up the food and (hoarding) taking it to their cabins as if there would be no more. She said the crew was assuring all that there was plenty of food, but many pax were ignoring this advice. At 16:29 CST she said that 1 of the tug boats was in site. And they they had been advised that they may not be into port until friday. Wmiller86 (February 11, 10:14 p.m.) – I just rec'd a text from my wife. - NO POTTIES ARE WORKING! That was all it said. LynnA (February 11, 4:28 p.m.) – We just got a text from daughter-in-law. She said she was miserable but no worries. Dbogusch (February 11, 2:36 p.m.) – Another update from coworker. People are slowly being let into their cabins but its stifling hot below decks. The "hamburgers" being served are meatless. Very limited hot food. Only water to drink. okiecruzer (February 11, 2:22 p.m.) – They [parents] said there is no power still, no toilets… , no meat. They slept on the deck last night (no tent, just open air) and will probably do so for the next two nights. They said they are doing this by choice – they booked an inner room without a window. They said there is no coffee or juice, only water. My dad said they were serving "hamburgers." He had one made just of cheese slices and another with only coleslaw, no meat on either. All alcohol service has been cut off. Wmiller86 (February 11, 2:11 p.m.) – My wife and 3 of her girlfriends are on the Triumph… My wife was able to call me Sunday night for a few minutes while Elation was alongside. My wife told me that it was pretty scary during the fire evacuation… She said that they were allowed back down into the cabins after awhile, but it is so hot that you cannot sleep down there. So they had set up a makeshift tent over deck loungers to sleep in. At the time I spoke to here, there was no toilets. They were using little red bags. And no running water, no lights, except emergency lighting. She said it was already pretty miserable. No hot food and no alcohol being served. There was still ice being served in soft drinks. None of the shops were open. Dbogusch (February 11, 2:02 p.m.) – Just found out a coworker is on that ship. She texted her boss this afternoon. She said there are very long lines for food and bathrooms. Some rooms running out of toilet paper. She said the ship is hot and people are cranky. She expects to be home Thursday or Friday. okiecruzer (February 11, 1:36 p.m.) – Just got word from my mom who is on Triumph. She said they would be back to Galveston Thursday or Friday. Morehouse14 (February 11, 1:28 p.m.) – Just received a text message from my wife. They are being served hamburgers and salad from another ship that is alongside. Lines are taking 2 plus hours to get through to get food and drink. Morehouse14 (February 11, 8:47 a.m.) – I know four people on this cruise, one of which is my wife. I have been in contact with her and the others. The cruise line says they are running on emergency generators… there are no lights or running water on the ship. Cabins have no power. They have to use bags and/or the shower to go to the bathroom. It is hot with no air moving below deck. They want everyone to stay in the public or open areas of the ship. jgomila198101 (February 10, 7:07 p.m.) – My sis just called. They have plenty of food; they are all fine but doesn't look like they will be back until Wednesday night. Said they are still having fun. Clinty76 (February 10, 6:56 p.m.) – Here is the absolute most current update directly from my wife aboard the ship. "We are about to get supplies from another cruise ship and apparently the tug boats should be here tomorrow around noon. Who knows how long it will take to get back to Galveston. We have no power AT ALL, which means we can't use the toilets, wash our hands or take a shower."